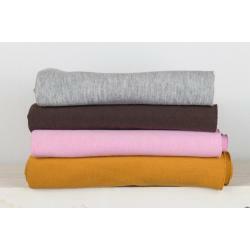 A lovely and soft jogging fabric, made of 80% cotton and 20% polyester. Ideal for making sweaters and training pants. There is a small stretch in the fabric, witch makes the fabric extra comfortable. Quality: Cotton - Polyester (80% - 20%) Width: 150 cm Weight: 205 g/m2 Product code: 1140003..
Quality: Cotton - Polyester (80% - 20%) Width: 150 cm Weight: 205 g/m2 Product code: 1140032..
Quality: Cotton - Polyester (80% - 20%) Width: 150 cm Weight: 205 g/m2 Product code: 1140030..
Quality: Cotton - Polyester (80% - 20%) Width: 150 cm Weight: 205 g/m2 Product code: 1140005..
Quality: Cotton - Polyester (80% - 20%) Width: 150 cm Weight: 205 g/m2 Product code: 1140019..
Quality: Cotton - Polyester (80% - 20%) Width: 150 cm Weight: 205 g/m2 Product code: 1140020..
Quality: Cotton - Polyester (80% - 20%) Width: 150 cm Weight: 205 g/m2 Product code: 1140023..
Quality: Cotton - Polyester (80% - 20%) Width: 150 cm Weight: 205 g/m2 Product code: 1140016..
Quality: Cotton - Polyester (80% - 20%) Width: 150 cm Weight: 205 g/m2 Product code: 1140027..
Quality: Cotton - Polyester (80% - 20%) Width: 150 cm Weight: 205 g/m2 Product code: 1140026..
Quality: Cotton - Polyester (80% - 20%) Width: 150 cm Weight: 205 g/m2 Product code: 1140017..
Quality: Cotton - Polyester (80% - 20%) Width: 150 cm Weight: 205 g/m2 Product code: 1140007..
Quality: Cotton - Polyester (80% - 20%) Width: 150 cm Weight: 205 g/m2 Product code: 1140031..
Quality: Cotton - Polyester (80% - 20%) Width: 150 cm Weight: 205 g/m2 Product code: 1140012..
Quality: Cotton - Polyester (80% - 20%) Width: 150 cm Weight: 205 g/m2 Product code: 1140022..
Quality: Cotton - Polyester (80% - 20%) Width: 150 cm Weight: 205 g/m2 Product code: 1140014..
Quality: Cotton - Polyester (80% - 20%) Width: 150 cm Weight: 205 g/m2 Product code: 1140025..
Quality: Cotton - Polyester (80% - 20%) Width: 150 cm Weight: 205 g/m2 Product code: 1140011..
Quality: Cotton - Polyester (80% - 20%) Width: 150 cm Weight: 205 g/m2 Product code: 1140010..